Bosch Rexroth is driving the next industrial revolution as a leading automation supplier and manufacturing company. With a huge automation portfolio and production experience from our own plants worldwide, we can offer leading automation and manufacturing solutions – from single piece to high volume production. Connected automation in manufacturing leads to a faster and more flexible production process, greater efficiency of material, and reduction of complexity and downtime. We move everything: Let Bosch Rexroth help you connect to industry 4.0. Now! We are driving the next industrial revolution. 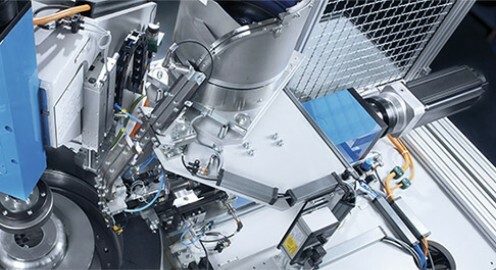 Connected automation technology in manufacturing leads to an innovative production process, greater efficiency of material, and a reduction of complexity and downtime. Let Rexroth help you connect to i4.0. Now! Thanks to the simple system design, IndraDrive Mi contributes to cost reduction not only in terms of the components, but also with regard to installation effort. Connected Automation platform from Bosch Rexroth is the most open ecosystem for future-proof automation and manufacturing solutions. From smart automation products to complete hard- and software architectures, IT integration and cloud connection – Industry 4.0 Now! Rugged hardware and unlimited performance – combined with integrated IT technology and a huge portfolio of machine application widgets and apps – this is Bosch Rexroth controls portfolio for PLC, Motion, Robotics and CNC applications. The combination of automation and modern IT technology enables unknown degrees of freedom, flexibility and efficiency in automation processes. Freedom of choice of the programming language and device platforms is opening up new integration opportunities for enhancing production workflow automation and flexibility. Industry 4.0 is all about connectivity. This toolbox enables the possibility to connect and integrate almost all kinds of devices, interfaces and standards. Direct connection of MES to automation via OPC UA, Database-connections, integration of office applications, smart devices, complete i4.0 upgrade kits for existing machines are just some of the possible solutions. Experience the most flexible decentralized drive system in the world: IndraDrive Mi. It has never been easier to build, change and use modular machines and lines. 100% cabinet-free, 100% flexible. Guiding and measuring device in one: The IMS-A integrated measuring system detects the absolute position and works with high precision, even in a rugged environment.